An important subject delivered in a very disorganized verbose book. Recommended for the more adventurous reader. Why choose between Scrum and Kanban when both bring many valuable perspectives? The Scrumban [R]Evolution demonstrates how a broad set of proven Lean and Agile principle can be effectively interwoven and managed within the context of a single framework. Unlike Scrum, defined by a set of rules that are known to work in combination, the aim of Scrumban is to keep moving forward, keep improving your processes to deliver the best product possible. 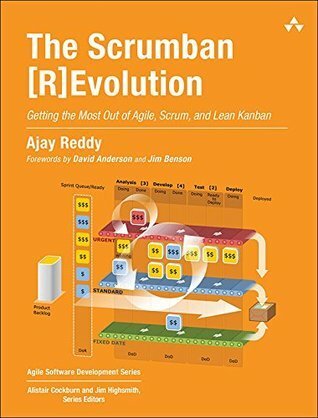 The Scrumban [R]Evolution raises really good points and I have no doubt the author is uniquely qualified for the task but the book is so disorganized and far too verbose that I was unable to stay focused on it. The main problem is the author try to cover all the benefits of Scrumban even before defining it. I completely missed the point of the first chapters and felt quickly bored, desperately waiting the book to finally dives into the subject. That never happened. After more than 300 pages, Scrumban is always a bit vague for me. What I particularly like in similar book is the real-world examples, used to support the main ideas but this book fails to deliver such interesting examples. The examples are too abstract and not sufficiently illustrated to really help the reader grasp the main concepts. The lack of clarity is particularly visible when discussing probabilistic forecasting. As an example of disorganization, there is just one lengthy appendix to cover unrelated subject like an overview of methodologies, the detailed case studies presented in the book, and various software tools around Scrum(ban). At the end, I recommend this book to the experienced agile coach armed a solid knowledge of Scrum and Kanban to be able to read between the lines to find out what Scrumban is about. Please take note that my review only concerns the book. Scrumban is a breath of fresh air in current agile world but if we want a true adoption of the methodology, I regret The Scrumban [R]Evolution is not a catalyst for people to embrace Scrumban. In addition to the book, the author created a well-designed online tool named “getscrumban” to introduce Scrumban concepts to newcomers. A good starting point if you plan to tackle the book.